It was once said that you must trust and believe in people or life becomes impossible . . .
Alli Carson has been through her own personal hell. With her father, the President of the United States, recently dead and her mother in a coma from a terrible accident, she has poured herself into her training to become one of the best FBI agents at the Fearington Institute. Her inspiration and solace comes from the one man with whom she has ever felt a kinship, National Security Adviser, Jack McClure. But when Alli becomes the prime suspect in a murder at Fearington, a wide ranging investigation is triggered, involving local homicide detectives, the secret service, the FBI itself, and Alli's own uncle, the billionaire lobbyist Henry Carson. And yet nothing is what it seems. What follows is a treacherous journey that leads Jack and Alli into a complex web of lies and deceit. 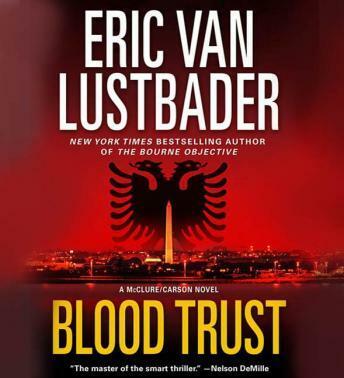 Using Jack's unique gifts to see the through the labyrinth of manipulation, their investigation leads them into the dark heart of the international slave trade, tied to a powerful Albanian crime lord whose ability and influence in global terrorism grows with each day. I am thoroughly enjoying this series. I got hooked on Lustbader back in college with The Ninja series. Now I'm very happy to have rediscovered his work.